At the end of last year, John Bohannan was asked to concoct a study that would show a the problems with online open access scientific journals. The story is long and definitely worth reading in full. In summary, 15 people were divided into 3 groups: one group were put on a low carb diet, another on a low carb diet + 1.5 oz of chocolate and the third group ate normally. They were weighed daily for 21 days and numerous parameters were measured. The researchers spent the weekend playing with the numbers and showed (statistically) that those eating chocolate lost weight more quickly. The study is a classic example of bad science. There are too few people in the group, they are not followed up for long enough and too many parameters were measured to name but a few problems. Any scientific journal would have thrown it out straight away..surely! 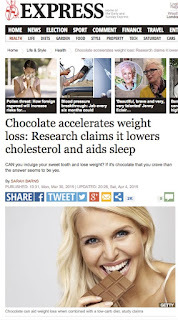 They managed to show that those eating additional chocolate lost weight faster (it was probably just a chance observation) and they submitted the paper to numerous fee paying open access journals. Half rejected it straight away. However, many took it and the "International Archives Medicine" published it without changing it. 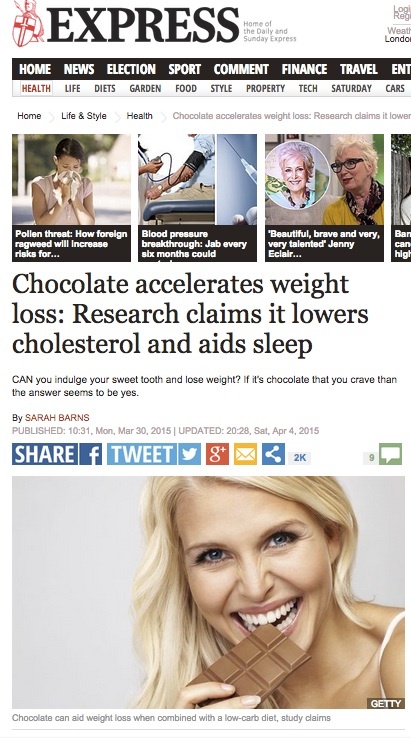 to hear that they can eat chocolate and lose weight. Good news in the dietary world travels fast. -Breast cancer sites abound with dietary advice. How many of the recommendations are based on sound science? -Health reporters are often very sloppy and don't do their research. Some years ago, I was quoted verbatim in the now defunct magazine "Real Simple" commenting on lung cancer. I know nothing about lung cancer. The researcher hadn't contacted me and had taken comments I had made about breast cancer and quoted them in an article about lung cancer: she had got her organs muddled up! -People want to read what they want to hear. -There are more and more open access journals being launched. Many will charge a fee from the authors to get their papers published. Not all of them are peer reviewed meaning not all of the the "science" is checked by experts. Don't be fooled by what you read. Clenbuterol has the infamous notoriety of being an execution improving medication and has been prohibited in most athletic rivalries. Utilization of clenbuterol for animals has been prohibited in the US and in the vast majority of Europe, yet it is as yet being utilized to build domesticated animals creation. Numerous competitors discovered liable for clenbuterol use assert they may have expended polluted meat and got off without real charges.